Saturday, April 27, Local Yarn Shop Day! Enjoy exclusive LYS Day yarn & knits, extra Yarn Card Dollar$ and more! Our intentionally-curated yarn and gift collection features companies owned by women or families, many of them from the United States. We support fair-wage, companies and those that foster ethical treatment of animals and responsible disposal of dye. After all, don't we all want to work with happy, healthy yarn?! Even our gift bags are made from recycled paper, not plastic! Looking forward to seeing you in the shop soon! ​Be sure to visit our WHAT'S NEW page! ​​And scroll down now to see what else is happening! ​​Not on our email list? LeeAnn Halley, owner of the Village Herb Shop, visits us to kick-off Local Yarn Shop Day and celebrate her new line of natural home and personal care products that she has created herself! 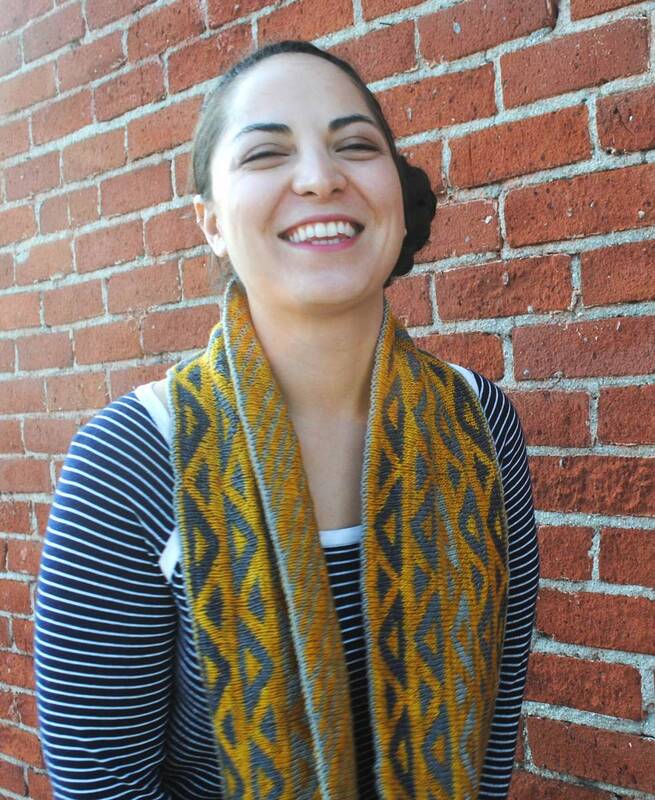 Nationally-known LA knitwear designer, instructor & blogger, Grace Akhrem, returns to The Artful Yarn for a one-day encore appearance! She's so highly sought-after as an exceptional instructor that The National Needlearts Association is featuring her Triangle, Diamonds & Squares class during its June national conference in Cleveland for yarn shop owners. If you missed joining us for our Spring Retreat in March, you'll want to be one of the first to register! THE most popular pattern from our Spring Retreat with Grace in March. You'll learn how to knit the holes while Grace gets you started on this fun, awesome-looking project. You'll review the pattern with Grace and learn her suggestions for knitting success, how to set up your knitting for this shawl and make it smaller or larger depending on your own vibe. Pattern provided FREE with the purchase of yarn for this project. Triangles, Diamonds & Squares . . . oh my! This is an exemplary class in all things short rows. If you missed Grace's workshop retreat with us in March, anyone who attended will tell you she is an awesome and patient instructor. She made complicated techniques easy and we all actually retained what we learned! Never be afraid or confused about short rows again! And enjoy this amazing class offered just for you! It's like Shop Small Saturday but just for local yarn shops and just for fiber fans like you!